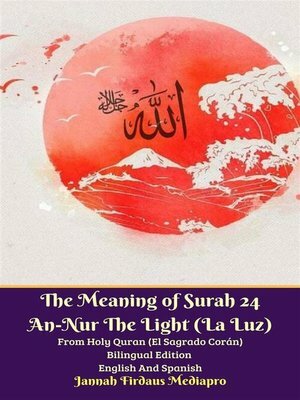 The Meaning of Surah 24 An-Nur The Light (La Luz) From Holy Quran (El Sagrado Corán) Bilingual Edition In English And Spanish Languange. Surah An-Nur (The Light) is the 24th sura of the Qur'an with 64 ayat. The general agreement of scholars is that this sura was revealed shortly before or after the Battle of the Trench in 5 AH. The surah begins with various explanations and decrees on or relating to corrupt sexual acts, family law, and specifications on the giving of testimony. Foremost amongst these rulings is God's punishment for adultery. This section ends with the pronouncement that good men and women should be paired together, as should corrupt men and corrupt women. This discussion turns into reflections on privacy and modesty, namely of hosts and women. Contained herein are several regulations and explanations of modesty, most directly lines traditionally used to argue for the wearing of hijab. After these prohibitions are cast for women, the text turns towards men, asking them not to oppress slavegirls into prostitution, and to marry those women who need husbands, despite their poverty. After a second statement of the Quran's status as a clear sign from Allah SWT, the famed Ayat an-Nur appears. This is often referred to as "the Light Verse", or "the Parable of Light", a mystical group of lines that has been the subject of much scholarship and reflection. "Allah is the Light of the heavens and the earth. The parable of His light is as if there were a niche and within it a lamp: the lamp enclosed in glass: the glass as it were a brilliant star: lit from a blessed tree, an olive, neither of the east nor of the west, whose oil is well-nigh luminous, though fire scarce touched it: Light upon Light! Allah doth guide whom He will to His light: Allah doth set forth parables for men: and God doth know all things."